Online Monopoly is now available for 2013. This year’s promotion, called McDonalds Monopoly Fortunes has even more chances for you to win and now has the additional feature of being available to collect and play the game online. Promotional stickers are available from 20th March until 30th April 2013. Read on to find out the last claim dates. Online Monopoly is similar to the standard Monopoly board game. Customers receive a Game Piece which contains a set of 2 or sometimes 3 Stickers that come with the purchase of certain menu items. Just like the board game these match to a property space on a Monopoly board. Peel off your Monopoly Fortunes Game Pieces to reveal your Stickers to find out if you're a winner. There are three ways to win; Instant Win, Collect To Win and Guaranteed Win using the NEW Online Monopoly Game Board. Inside each Game Piece you will find Stickers. 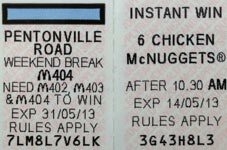 The picture below is an example of what you are collecting; on the left is a Property Sticker for the Collect To Win and Guaranteed Win game and on the right is an Instant Win for 6 Chicken Nuggets. There’s a wealth of prizes up for grabs instantly. If it’s a Food Instant Win Prize simply bring your winning game Sticker to any participating McDonald’s restaurant. Please remember to tell the member of staff you are redeeming a winning food item before ordering, thank you. Please note that only food can be redeemed at McDonald’s restaurants and to redeem all other Instant Win Prizes (see list below) just follow the instructions on the game Sticker. The last claim date for Instant Win Prizes is the 14th May 2013. Just like the board game simply collect and complete the property sets on your Game Board to win an amazing prize (see list below). To claim a Collect To Win Prize all you have to do is follow the instructions on the game Sticker. The last claim date for Collect To Win Prizes is the 31st May 2013. Firstly you need to Register before you play. Once registered simply add your Collect To Win Stickers to your online Monopoly Game Board. Once you have entered your Sticker you will be notified of your prize and how to claim it. Online Monopoly sounds like a great way to play and guaranteed prizes! Urbanz Headphones (50,000x Collect To Win). When does the promotion start and when does it finish? In the United Kingdom the promotion starts on 20th March 2013 and it is scheduled to last until 30th April 2013. You can register online from 6th March 2013. What is the deadline for claiming a prize? The final date to claim a food prize is 14th May 2013 and the final date to claim all other prizes is 31st May 2013, however some of the prize winning vouchers have different expiry dates. How do I colelct a Game Piece/Sticker? Whilst stocks last you can get a Game Piece/Sticker with every purchase that qualifies for the promotion at one of the participating McDonald’s restaurants. 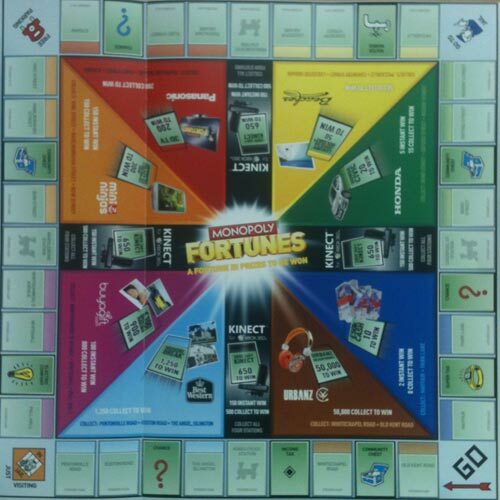 Each Game Piece contains 2 or sometimes 3 Stickers, the Stickers could be Property Stickers or a combination of Instant Win and Property Stickers. What are the qualifying purchaces? How and where can I get a Game Board? Go online and register for your own online Monopoly Game Board or collect a printed leaflet from any of the participating restaurants. I have won. How do I claim my prize? You can claim some Instant Win prizes and Online Game prizes straight away. You will have to complete and return a claim form online or by post for every Property Set Sticker-prizes, some of the Instant Win prizes and some of the Online Game prizes. Trademarks belong to their respective owners. OnlineMonopoly.co.uk is in no way affiliated with, associated with or approved or endorsed by Hasbro or Parker Bothers.